Time again for another Riveting Expat Read in which I shine the spotlight on a new (or new to me) book in this varied and rapidly growing niche. There has been a slow but steadily expanding upsurge in books written by and for expats/global nomads/TCKs which examine life lived cross-culturally, and we are all the richer for this. Today’s choice is a doozy, one seriously stellar book. 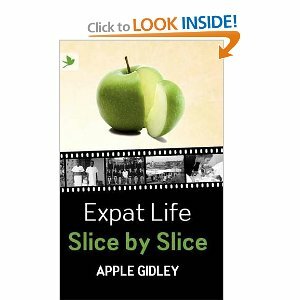 Apple Gidley’s Expat Life: Slice by Slice is, simply put, one of the very best expat memoirs I’ve read in recent years (and I’ve read many). Why this high praise? In a word, Expat Life: Slice by Slice is complete. As an avid reader and expat myself, I’ve enjoyed many a book about travel and/or life overseas. I appreciate a good story as well as the next person, easily becoming wrapped up in the storyline of a well-told tale regardless whether it’s contemplative, epic, tongue-in-cheek, earnest or comedic in style or tone. As a writer and author, what I don’t like – and hence, you’ll never read about them here – are books that are boring or poorly written. Or even worse, boring because they’re poorly written. Don’t get me wrong: I’m not talking literary snobbishness or grammatical policing or editorial infractions here. I’m referring to books where the writing is wooden or heavy handed or overwrought, the dialogue is non-existent or dull or simply not believable, and the author just never seems to find his or her voice. Sort of like a joke that falls flat, so badly mangled in its delivery that not even an hilarious punchline can save it. Which is why Expat Life is such a joy. Rather than simply relaying her life story in chronological sequence as far too many authors are wont to do, this Adult Third Culture Kid, parent and now grandparent to TCKs has achieved the trifecta of good writing, good storytelling and making us care. Apple Gidley shows rather than tells, not simply in her dialogue but in her narrative writing as well. She possesses a good ear for dialogue, moving the story along in believable fashion. She also touches on a wide range of issues across the human condition, covering myriad topics without once evoking images of a scribe hunkered down over a manuscript consulting a laundry list of ‘must covers’ (as in ‘I must cover this, can’t forget to cover that’). Gidley has spent a lifetime living and traveling on all of the continents save Antarctica, although it’s probably just a matter of time before she reaches the latter. She’s experienced colonial rule firsthand and witnessed how decolonization, the emergence of newly independent states, globalization and advances in technology have transformed expatriate life over the intervening years. Yet the writing never feels dated, remaining fresh and timely throughout. The stories she weaves run the gamut from humorous to sad, difficult to the lighthearted, uneasy to fascinating and everything in between. In addition to relocating 26 times while living in twelve countries, Gidley has, among other things, become certified as a Montessori instructor, served as British Honorary Consul in Equatorial Guinea, taught English, established and edited a quarterly magazine for an international charity in Asia, worked in a scuba shop and written for their diving newsletter, blogged for The Telegraph in the UK. Whether by worldliness, temperament or some combination thereof, Gidley falls squarely on the side of emphasizing our common humanity and what brings us together rather than differences that might divide us. More so than most, she is able to put her expat life experiences into perspective and share those highly personal thoughts with the reader. It’s no surprise that her chapters dealing with topics as varied as the special challenges of raising TCKs and parenting across time zones, staying connected with family and friends, dealing with parental aging, illness and death, and pondering repatriation and life after the empty nest are rather dog-eared from my constant return to particularly pithy or poignant insights. In the end, she takes us with her and makes us care. And that makes this sweeping saga of multi-generational expatriate life a romping good read. Learn more about Expat Life: Slice by Slice (Summertime Publishing, March 2012) at http://www.expatapple.com/ or purchase it (paperback or Kindle version) on Amazon here. Apple Gidley blogs regularly for The Telegraph and is on Twitter (@ExpatApple) and Facebook (http://www.facebook.com/apple.gidley). This has been on my must-read list for some time, but somehow I never got around to it. I think it’ll be my Christmas holidays indulgence — my gift to myself. Thanks for the review, Linda. You’ve never steered me wrong. That was a fantastic review. 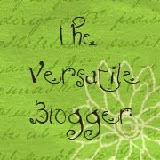 Wow Linda – nice review! We are offering this book free to anyone who purchases our Delicious Burdens expat support membership in December. I don’t mean to be advertising here – but this is a chance for readers to get the book free plus great everyday support! That IS a terrific gift, Norm! Not only do readers/expats get the benefit of Expat Everyday Support Center’s experienced support from you and Carol, they get Apple Gidley’s great memoir free, too. Happy Sinterklaas to you and your family! 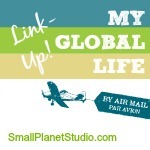 So glad you got round to reading this book – it’s the best book I’ve ever read on expat life. Eloquent and beautifully crafted. Apple has a gift for story telling, the happy and sad, which leaves you roaring with laughter or choked with tears.